After years of awkwardly stuffing my camera into random bags, I decided it was finally time to get a proper bag. 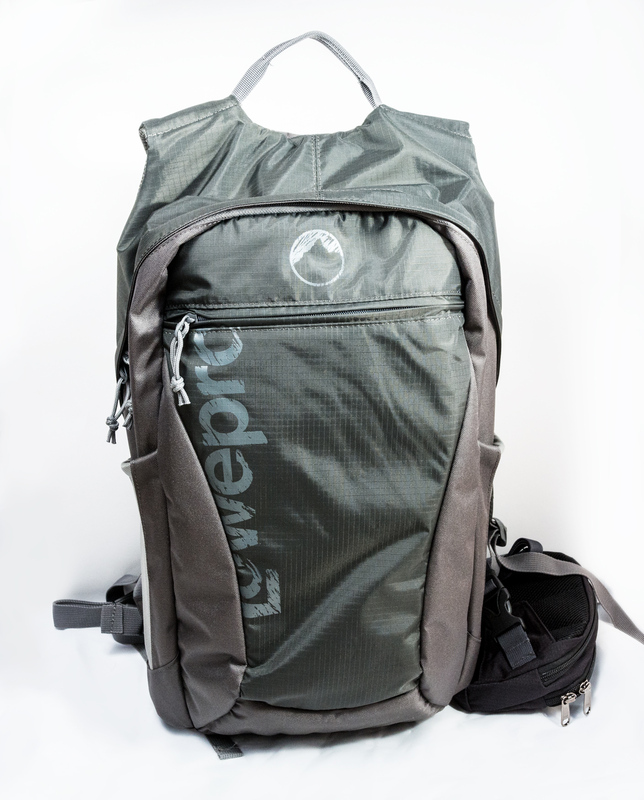 A 20% off REI coupon gave me extra incentive to pull the trigger last weekend and pick up the Lowepro Hatchback 22L in slate gray. I’ve only had it a week, but I filled it up with my basic gear and marched around the neighborhood this morning to take pictures of the pretty pink flowering trees. Here are my first impressions (and a quick attempt at product photography). I almost got the smaller 16L version, but the 22L isn’t *that* much bigger and seems to hold a lot more stuff. I’m glad I went with the larger one. There are two slim pockets at the front of the bag, which might hold a tablet or maybe a very slim laptop (don’t hold me to that, though). So far, I’m using one of them for a Rogue FlashBender. I couldn’t get a good picture of the top hatch area, but it’s got a good amount of open space, plus a zippered pocket toward the back and two small elastic pockets in the front, which are the perfect size for two speedlights. I use the zippered pocket for all my normal small flash accoutrements, such as a pack of colored gels, a grid, remotes, etc. The hatch area isn’t padded and is more exposed to potential theft, but therein lies the compromise of a smallish, convenient pack. The black lump on the side is a little Eagle Creek pack that I attached to the pack strap to serve as an SD card/battery/cleaning kit holder. 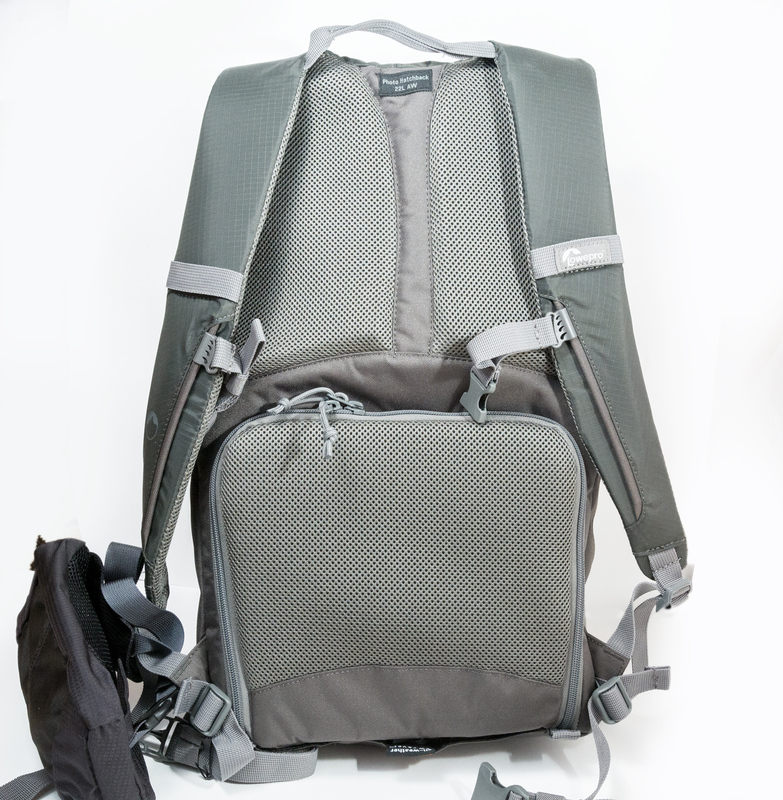 I love the Hatchback so far, but it doesn’t have many little pockets for organizing, and I wanted a way to get to the small essentials quickly and without taking the pack off. 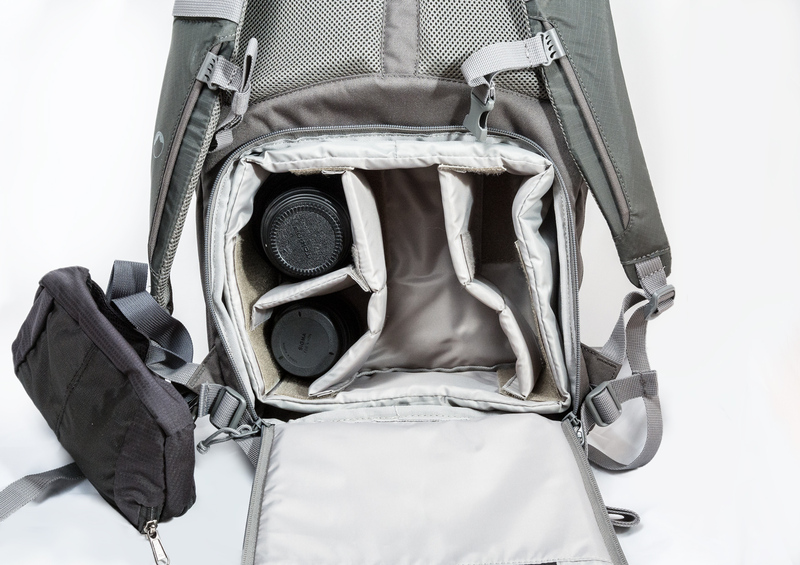 The camera compartment is nicely padded and opens on the inside of the pack, so a thief isn’t going to shimmy open the zipper and walk off with your gear while you’re wearing it. The padded part is removable, and the section dividers are velcro’d and can be moved around to whatever configuration works for you. It’s a nice size for me and my gear… mostly. My D7100 with normal walking-around lens (Sigma 18-35mm f/1.8) fits comfortably, and I can arrange another 3-4 smallish lenses around it. However, if I want to bring the Tamron 70-200mm F/2.8 with me, it would have to go in the less-protected top hatch. It *might* fit in the camera compartment with some creative rearranging, but not much else is going to fit in there with it. 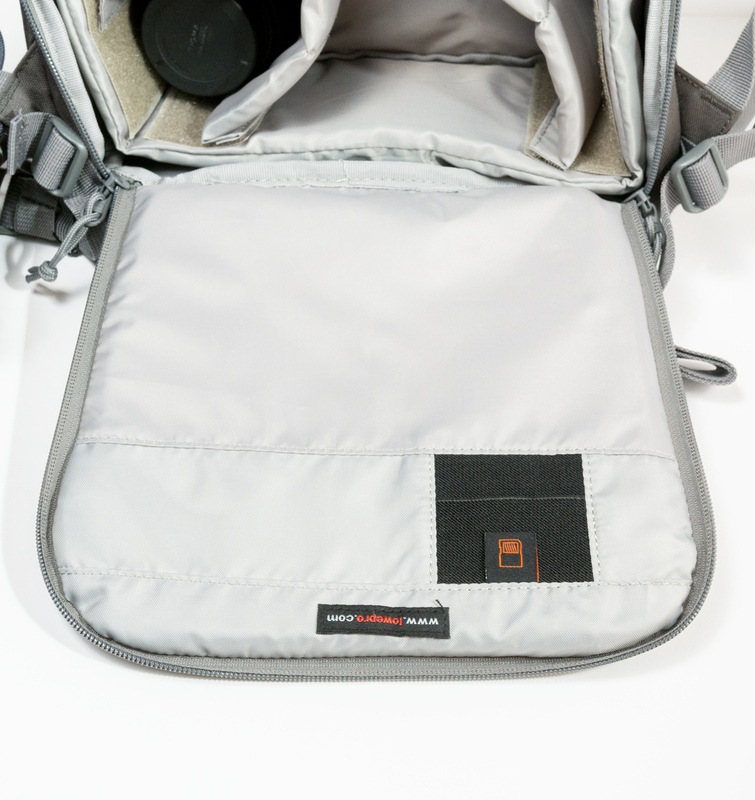 If you use a very large DSLR, battery grip, or a lot of large lenses, this is probably not the bag for you. The flap even has a little SD card pocket. 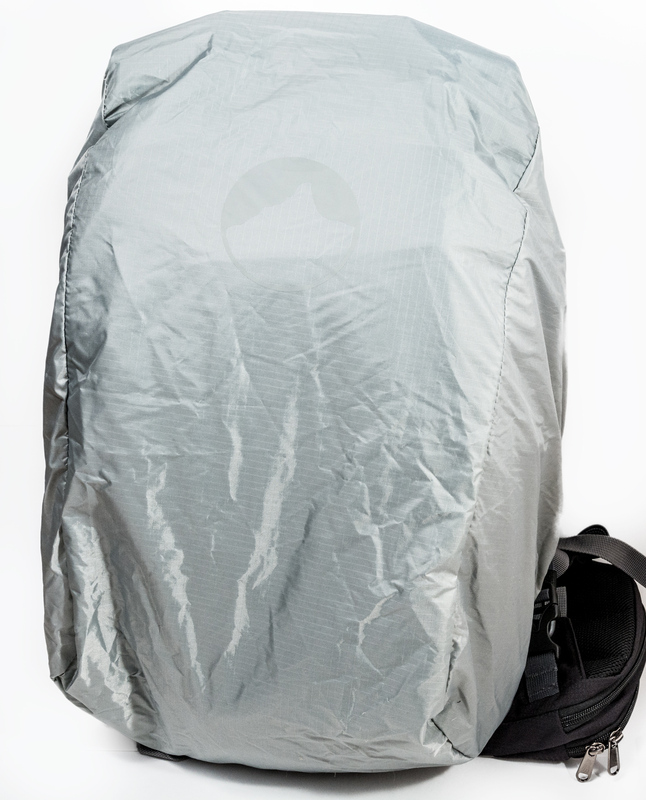 There’s a raincover in the bottom of the pack which fits nice and snugly over the pack… unlike some of our other hiking packs, where the raincover is forever sliding off or catching the wind and trying to be a kite. I think this one will actually keep everything nice and dry, and it’s easy to get to. Overall, I’m very happy with the bag so far, and I’m looking forward to taking it along on some adventures.